It was a sad goodbye during some days from the whole family Llanos. In such a short time, sharing their lives, I had nearly become a member of this great family and they’d become my second home in Colombia. Who knows when we will see us again? Alexander escorted me to the outer frontier of Pereira and I was left alone on the road with my memories and thoughts. On the distant horizon droning tempests (truenos y rayos) fitting with my mood. I passed the puente helicoidal, the only serious ascend this day. In Chinchiná, I had lunch surrounded by the whole friendly and curious kitchen staff. I seemed to be the first stranger on a bike in their lives. When I asked for the way to a hostel, a man insisted to accompany me to the central hotel. The next day, after a tasty juice of Chontaduro (will I ever come to an exhaustive description of these fruits here?) 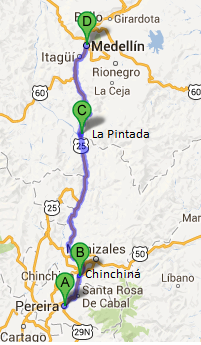 was an easy trip along the Río Cauca to La Pintada, a bald transit village along the road. I found an hospedaje for only 4 Euros, suspicious at first, but proper and without una mujer vieja y gorda during the hot but quiet night. After the day on the bicycle, I was rather hungry that evening but run out of cash. What a chance that on the abandoned table nearby someone had forgotten half of its patacón con guiso! I had just eaten it, when my neighbour came back from a phone call. Many excuses! But I needed the power for the last stage to Medellín: only 75km but with 2000 never ending altitude meters to a pass at 2570m. The landscape was definitely worth the pain: a road on the mountain ridge between St. Barbara and Terminales with a marvellous view to both sides. Unfortunately, the descent was in heavy rain. Rather frozen, I arrived Medellín in the afternoon traffic and went straight to the closest hostel in the modern barrio El Poblado. In total 240km with 3960 altitude meters. Dieser Beitrag wurde unter Auf Englisch, Vivencias abgelegt am 28. Mai 2013 von skuttruf. Automatische Übersetzung der englischen Texte z.B. mit http://translate.google.com/. Please use directly copy&paste into http://translate.google.com/ for an automatic translation of the german texts. Para traducir, se puede emplear e.g. http://translate.google.com/.